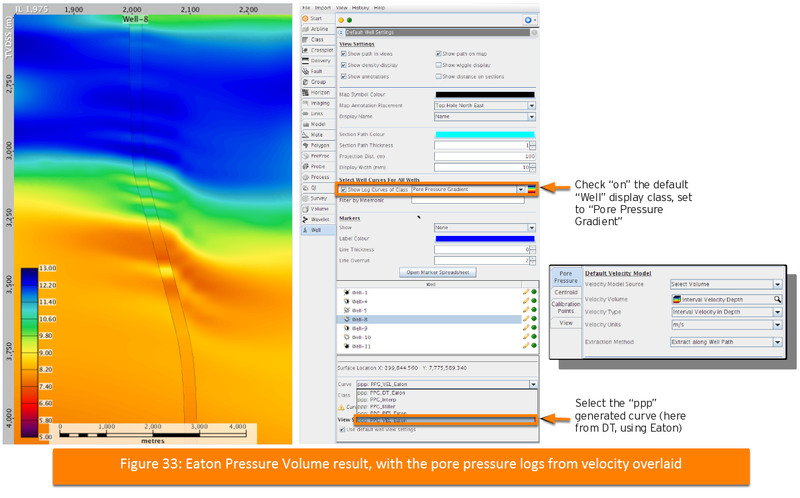 Once all global NCTL and Eaton parameters are established for the PPP from velocity model, two processes are then used to generate a 3D pore pressure volume. This is already generated for the well verification (Figure 25 in Density volume and Overburden Pressure (OBP)). In the Process tab, create “PP: Eaton Pressure Volume” (Figure 30) (see also PP: Eaton Pressure Volume). The velocity and density volumes are those used for PPP and OBP in the 1D verification. The NCTL formula may be copied from the Well Settings tab, Velocity NCTL section; the Hydrostatic Gradient and Velocity Exponent from the Pore Pressure tab. Note: For the volume to match the well calibration, ensure there is no “Eaton Velocity Exponent Override” active when verifying the PPP at wells from the velocity model. The same procedure is used to derive a pore pressure volume using Miller's method. 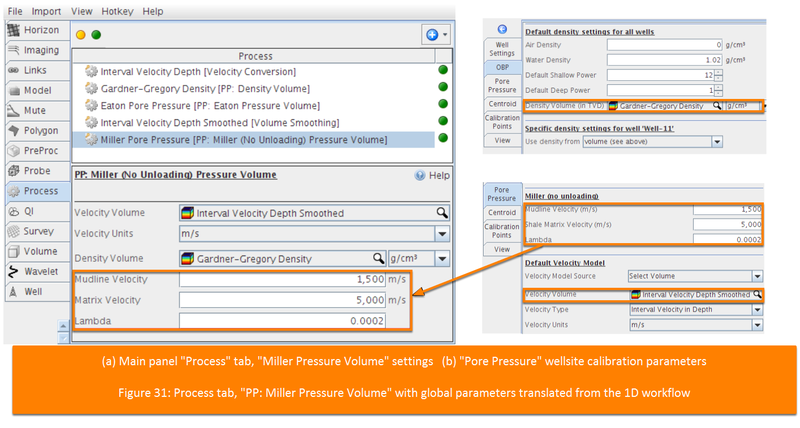 In the Process tab, create “PP: Miller Pressure Volume” (see also PP: Miller (No Unloading) Pressure Volume). 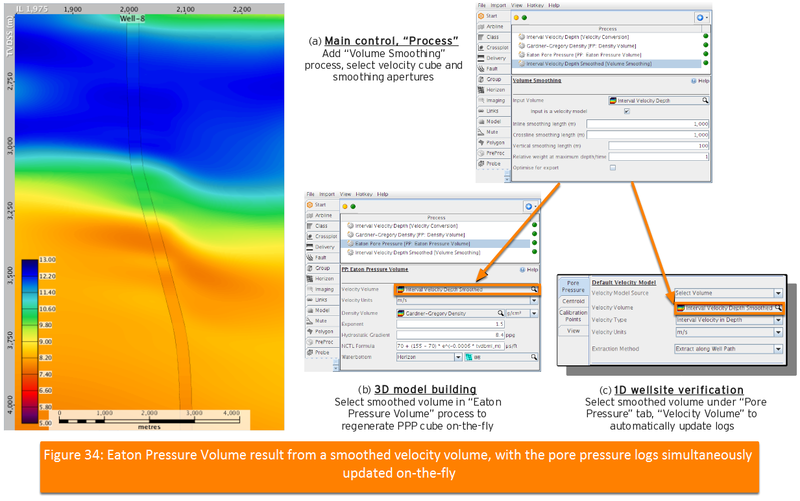 The velocity and density volumes are those used for PPP and OBP in the 1D workflow. The values for “Mudline Velocity”, “(Shale) Matrix Velocity”, and “Lambda” may be copied from the Pore Pressure tab. Figure 31 shows this process of parameter entry, from the 1D well calibration to the 3D model building process. The pressure predictions from velocity should match those from the OSCTL (which should in turn match the well calibration points). This will justify the robustness of the predictions away from the well. 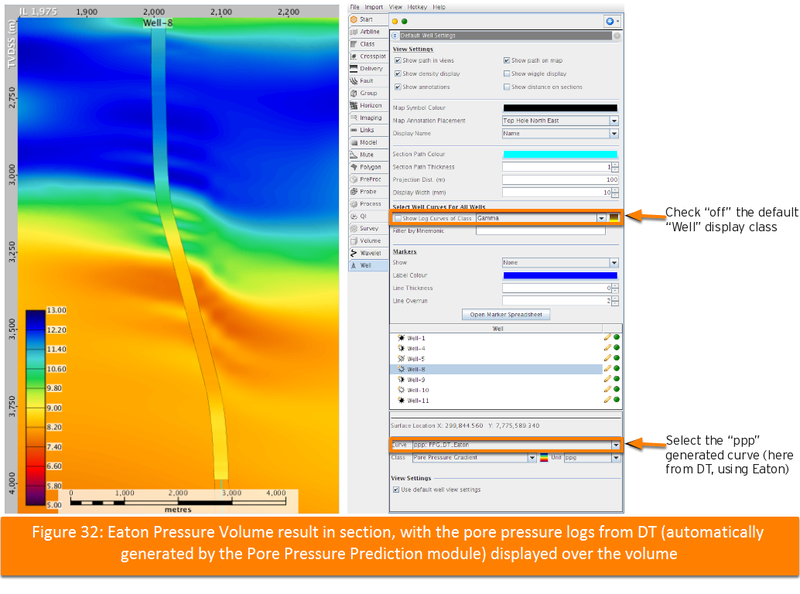 Figure 32 shows the results of the “Eaton Pressure Volume” process, and procedure to select the Well curve, in this case the “DT_Eaton” result. Figure 33 shows the same results with the logs from “VEL_Eaton” overlain, and setting these logs to the global “Pore Pressure Gradient” well curve class. Figure 34 shows how to apply a “Volume Smoothing” process to the velocity volume. This process is then used on-the-fly for the 3D model building and 1D log generation.